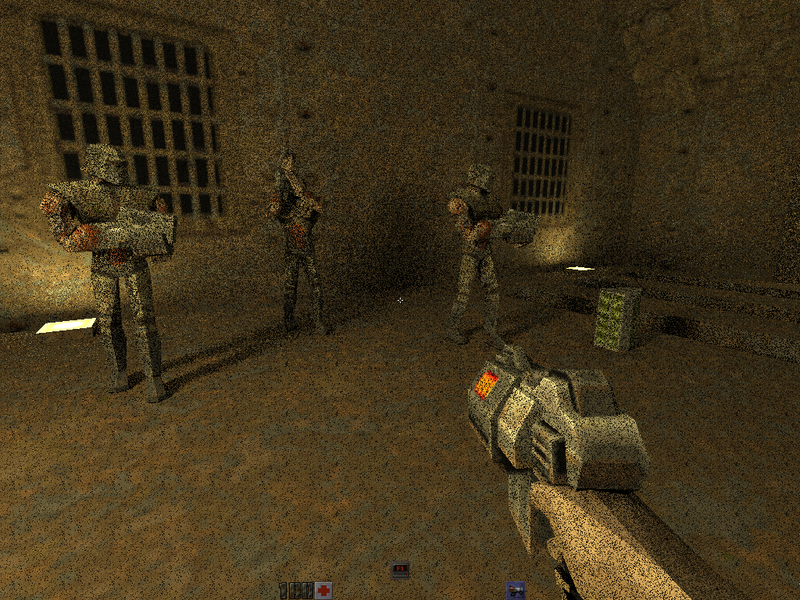 Last week, Edd Biddulph released the code and some videos of a very impressive project he's working on: a real-time path traced version of Quake 2 running on OpenGL 3.3. The path tracing engine behind this project is quite astonishing when you consider the number of lightsources in the level and the amount of dynamic characters (each with a unique pose) that are updated every single frame. I had a very interesting talk with Edd on some of the features of his engine, revealing that he used a lot of clever optimisations (some of which are taking advantage of the specific properties of the Quake 2 engine). All dynamic geometry is inserted into a single structure which is re-built from scratch on every frame. Each node is an axis-aligned bounding box and has a 'skip pointer' to skip over the children. I make a node for each triangle and build the structure bottom-up after sorting the leaf nodes by morton code for spatial coherence. I chose this approach because the implementation is simple both for building and traversing, the node hierarchy is quite flexible, and building is fast although the whole CPU side is single-threaded for now (mostly because Quake 2 is single-threaded of course). I'm aware that the lack of ordered traversal results in many more ray-triangle intersection tests than are necessary, but there is little divergence and low register usage since the traversal is stackless. The light selection is a bit more tricky. I divided lightsources into two categories - regular and 'skyportals'. A skyportal is just a light-emitting surface from the original map data which has a special texture applied, which indicates to the game that the skybox should be drawn there. Each leaf in the BSP has two lists of references to lightsources. The first list references regular lightsources which are potentially visible from the leaf according to the PVS (potentially visible set) tables. The second list references skyportals which are contained within the leaf. At an intersection point the first list is used to trace shadow rays and make explicit samples of lightsources, and the second list is used to check if the intersection point is within a skyportal surface. If it's within a skyportal then there is a contribution of light from the sky. This way I can perform a kind of offline multiple importance sampling (MIS) because skyportals are generally much larger than regular lights. For regular lights of course I use importance sampling, but I believe the weight I use is more approximate than usual because it's calculated always from the center of the lightsource rather than from the real sample position on the light. One big point about the lights right now is that the pointlights that the original game used are being added as 4 triangular lightsources arranged in a tetrahedron so they tend to make quite a performance hit. I'd like to try adding a whole new type of lightsource such as a spherical light to see if that works out better. I'm making explicit light samples by tracing shadow rays directly towards points on the lightsources. MIS isn't being performed in the shader, but I'm deciding offline whether a lightsource should be sampled explicitly or implicitly. Translucent surfaces can be lit and can receive shadows identically to all other surfaces. Hardware anti-aliasing can be used, of course. Quake 2 sorts translucent BSP surfaces and draws them in a second pass, but it doesn't do this for entities (the animated objects) so I would need to change that design and I consider this too intrusive and likely to break something. One of my main goals was to preserve the behaviour of Q2's own renderer. I'm able to eliminate overdraw by making a depth-only pre-pass which even uses the same GL buffers that the raytracer uses so it has little overhead except for a trick that I had to make since I packed the three 16-bit triangle indices for the raytracer into two 32-bit elements (this was necessary due to OpenGL limitations on texture buffer objects). It's nice that I don't need to manage framebuffer stuff and design a good g-buffer format. If you want to take a look at the main parts that I wrote, stick to src/client/refresh/r_pathtracing.c and src/client/refresh/pathtracer.glsl. The rest of my changes were mostly about adding various GL extensions and hooking in my stuff to the old refresh subsystem (Quake 2's name for the renderer). I apologise that r_pathtracing.c is such a huge file, but I did try to comment it nicely and refactoring is already on my huge TODO list. The GLSL file is converted into a C header at build time by stringifyshaders.sh which is at the root of the codebase. - This whole project is only made practical by the fact that the BSP files still contain surface emission data despite the game itself making no use of it at all. This is clearly a by-product of keeping the map-building process simple, and it's a very fortunate one! - The designers of the original maps sometimes placed pointlights in front of surface lights to give the appearence that they are glowing or emitting light at their sides like a fluorescent tube diffuser. This looks totally weird in my pathtracer so I have static pointlights disabled by default. They also happen to go unused by the original game, so it's also fortunate that they still exist among the map data. - The weapon that is viewed in first-person is drawn with a 'depth hack' (it's literally called RF_DEPTHHACK), in which the range of depth values is reduced to prevent the weapon poking in to walls. Unfortunately the pathtracer's representation would still poke in to walls because it needs the triangles in worldspace, and this would cause the tip of the weapon to turn black (completely in shadow). I worked around this by 'virtually' scaling down the weapon for the pathtracer. This is one of the many ways in which raytracing turns out to be tricky for videogames, but I'm sure there can always be elegant solutions. Edd also said he's also planning to add new special path tracing effects (such as light emitting particles from the railgun) and implementing more optimisations to reduce the path tracing noise.